The Brazilian Congress has begun expulsion hearings against 11 deputies accused of involvement in a vote-buying scandal that has hit the government. The former speaker of the lower house, Joao Paulo Cunha, is among those who could be expelled. He is a member of the governing Workers' Party, which is accused of buying the support of its coalition allies. 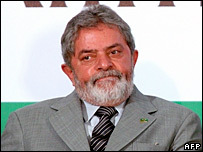 The scandal has damaged President Luiz Inacio Lula da Silva's popularity. Two deputies had already resigned before the proceedings were announced. By doing so, they retained the right to run in elections. If the other 11 are expelled as result of the probe, they will be banned from political office for eight years. The Workers' Party admitted that unofficial payments were made, but said it was common practice in Brazilian politics. Correspondents say the government hopes the disciplinary proceedings will draw a line under a scandal that has eroded its popularity. President Lula is hoping to run for a second term in next year's elections. He has not been implicated in the scandal.